1. Remove all features not really to infinite stash. The purpose is to have a small core that can be more easily maintained and ported to newer D2 versions. 2. Rewrite a lot of the core module loading code and offset/function pointer retrieval in order to facilitate the updating of the mod. 3. Use modern C++ practices. I was able to remove a lot of preprocessor usages that were being used before (I still need to remove a lot more of them and move more of those preprocessor substitutions into the new object model) and implemented a proper object model for each of the libraries. Due to the new object model, it is much more easy to read the code and see what functions you would need to look for in the new version. I don't think that updating to 1.14 would be as difficult as before, and even if Blizzard merged all of the .dlls into the .exe, it might be easier providing that once you load up Game.exe and retrieve its base offset, every other offset that you would get would be based off of that one. With the new object model in place, the internal infrastructure can remain the same. All function pointers for the corresponding version are dynamically retrieved when the LibraryLoader first starts up (Before anything else). It is released under the GPLv3 since that's the license Yohann used. I'm not a pro at ASM so I'm still trying to learn ways to improve my reverse engineering skills and be able to better find offsets. At the moment the only idea I have is to use the latest 1.13d offsets and try to do a pattern match for each function that the app requires, that would probably only get us so far until something more than just updating the function pointer kicks in. If anyone wants to assist in updating it to 1.14, now would be the time to do so. EDIT: I wasn't able to figure out how to get my Visual Studio's debugger to hit a breakpoint for the project, so I did all of this by just using the log file output. It was a pain but it's not the first time I've had to work on something without a debugger. EDIT 2 (13/9/17): I figured out how to attach the debugger to the code. At the moment I'm able to debug anything after the DLL is loaded and called by D2 (attach to Game.exe). However, I'm still trying to get the debugger to work during the init stages of the DLL (Before D2 fully starts but the dll's init is called).. It might be as simple as attaching to the Gardenia.exe with specific settings (and of course having debug symbols). Last edited by FearedBliss on Thu Oct 04, 2018 9:51 pm, edited 4 times in total. FearedBliss" wrote: EDIT 2 (13/9/17): I figured out how to attach the debugger to the code. At the moment I'm able to debug anything after the DLL is loaded and called by D2 (attach to Game.exe). However, I'm still trying to get the debugger to work during the init stages of the DLL (Before D2 fully starts but the dll's init is called).. It might be as simple as attaching to the Gardenia.exe with specific settings (and of course having debug symbols). You are going to struggle a bit with this; I'd recommend using OllyDbg or x64DBG and using the break on new module loaded. Else an old trick that works, use MessageBoxA with MB_APPLMODAL from the DllMain function. Thanks Necrolis for the tips. Slowing down the init so that I have enough time to attach to Game.exe before the DLL does its operations seems like the easiest way to go given the situation. Probably using a 10 second timer in DllMain would work as well, but I like your idea of using the modal dialog better. Also I do have olly and x32dbg on my machine so I will try the break on new module as well, I usually avoid having multiple debuggers or dissemblers attached but maybe it won't cause too much instability. EDIT (19/9/17) - Necrolis, the messagebox tricked worked wonderfully. Now I can debug all of the dll code, thanks! 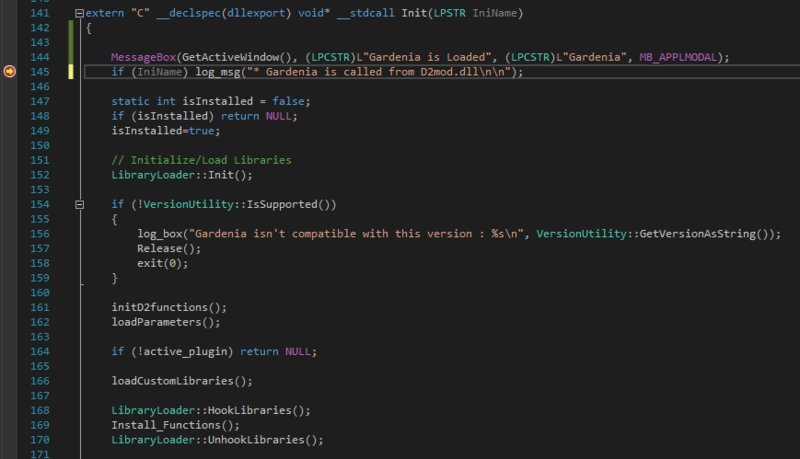 Alright guys, after a few weeks of hard work and more than 40 hours, I'm happy to announce version 1.00 of Gardenia. Hopefully my efforts to rewrite/restructure/and encapsulate all of the D2 functions in the mod will allow people to more easily maintain and upgrade the mod. There are too many changes to list, but you can read the github commit descriptions if interested, many of them have detailed explanations of what happened in that commit. Personally I only cared for supporting versions 1.09b and 1.13d so those are the only ones that I'm supporting in my branch. More information can be found in the read me. Ultimately, moving to a 1 version system is probably best, I probably will end up doing that. People could always just stick to an older version to play on the older versions of D2. Supporting only one version will allow a lot of flexibility, increase maintainability, and reduce workload. I've re-uploaded the sources in case you wanna work on it. - TCP/IP (LAN) is now fixed. more easily be ported to newer versions. Last edited by FearedBliss on Sat Oct 06, 2018 11:08 pm, edited 2 times in total. Alpaca 1.3.1 is now available. do not have the debugging DLLs necessary to run it in the "Debug" build. removing these options to remove configuration clutter. the d2 version and the alpaca version. These colors can now be independently set. - The ability to disable command inputs in game has been removed. - The documentation has been updated and clarified. be one configuration file (Alpaca.ini) which will provide all exposed options. - The Alpaca.log has been significantly cleaned up. - "MaxPersonnalPages" has been changed to "MaxPersonalPages"
of the game during normal play. fail to load if it uses Unix line endings and not CRLF. surrounded by "" instead of the current degrees string. know exactly which page they are looking at. - Localization has been removed, and English will be the only language displayed. part of PlugY and thus there really aren't many strings to localize either way (about 12). - Custom Library Support has been removed. internal behavior related to memory/strings. - More debugging statements have been added to Alpaca.exe's "Read process memory failed." - Added numbers to some additional assertions messages. - An experimental fix for the read process memory failed  /  is now active. "Library" option has been removed since loading Alpaca.dll is given and the only dll supported. if it is an Alpaca bug). stashes would cause an access violation and crash the program. types for the duration of the game session. This command will take you to the corresponding page. Lots of improvements, cleanups, stability throughout the codebase. - The "ActiveSharedStash" and "ActiveSharedGold" options have been consolidated into "SoloSelfFound". that some people were having when their "InstallPath" wasn't set. - Cleaned/Partially re-wrote the main initialization function. - Alpaca no longer launches the game "normally" if Alpaca failed. be launched as if you had ran Game.exe directly with no mods. - Will now check for version incompatibility at an earlier stage. No point to keep processing stuff it it isn't compatible. narrow down the root cause of this issue. - Removed remnant D2Mod support code since this is a 1.09 mod and D2Mod is a 1.10 plugin system. display the following tooltip for the appropriate language: "Solo Self Found is enabled. Good Luck!". The repo link returns a 404, and your Github repo list no longer has Alpaca listed. Is the project discontinued?